The massive bomb Trump dropped on Afghanistan in April was more bad news. Yet in Kabul, the work of peace continues. Afghan Peace Volunteers have been welcoming delegates from my group, Voices for Creative Nonviolence, from the United States and England, one or two at a time, over the past several months. On a visit last month, I was able to travel by bus to a small village where relatives were celebrating the marriage of Abid and Zahro. Our group from Kabul sat with the village women in a large tent. Abid’s sisters and cousins, wearing brightly decorated gowns, looked exotic and beautiful. Women took turns dancing and singing. It was a welcome change to be able to travel to a small village, as our movements have been restricted during recent visits in Kabul. The villagers tend almond and mulberry trees as well as grape vines. On the way there, when the bus driver realized a foreigner was on board, the rate was suddenly doubled. The Afghan Peace Volunteer responded by saying, “OK. We’ll walk.” I was exhilarated, walking alongside orchards with mountains looming on all sides. The bus driver soon found us and negotiated a more reasonable price. 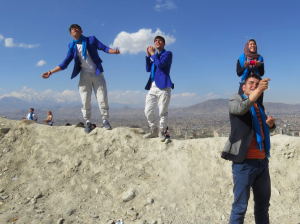 The arrival of spring marks the Afghan New Year, with family gatherings, and opportunities to plant fields, celebrate, and relax. This past winter, for the fourth consecutive year, the Volunteers supported seamstresses and provided a living wage to sew warm duvets for distribution to refugee camp families. They redoubled efforts on the “Street Kids’ School,” which provides young street vendors opportunities to make up months or years of schooling they missed while supporting their families. Students provide rations of rice and cooking oil in trade for classes at the Borderfree Center. The kids, and a growing circle of neighbors, also learn about the history and practice of nonviolence. On my last full day in Kabul six of us went to the Emergency Surgical Center for Victims of War to donate blood. Courageous workers there have faced innumerable crisis situations following attacks in Kabul. Their healing touch even includes well-tended lawns and gardens for patients to rest in while recovering. Patients who can be mobile emerge from full wards, on crutches or in wheelchairs. We see them converse softly. And always there are a few children in wheelchairs racing down the cement walkways. The Emergency hospital in Lashkar Gah operates under full war-zone conditions and still manages to run clinics and ambulance services. Afterward, a teacher, Nematullah, took me to a refugee camp to visit a class of girls aged five to fourteen. I sat on uneven, rocky ground in a primitive room with twenty-five students. For two hours, the girls were easily engaged in stories, activities, grammar exercises, and writing assignments. I felt grateful and hopeful as they bade us farewell. People throughout Kabul cope with contaminated water and air, shortages of food and electricity, and a disastrously inadequate sewage and sanitation system. My colleague Dr. Hakim observes that among the dozens of young volunteers at the Borderfree Center, every family is dealing with severe traumas. In my short ten-day visit here, Barath Khan traveled to his home province of Paktia for the funeral of a cousin killed by an unknown assailant. Meanwhile young Bismillah’s family was mourning the recent death of his twenty-eight-year-old brother who was killed in action serving with the Kabul government’s army. Nawid learned that his young cousin living in a neighboring province runs to hide every time he hears the sound of armed U.S. drones flying overhead. Three days previously, the Center had hired two buses to take Street Kids and Volunteers to a high hillside for their “Fly Kites not Drones” celebration. 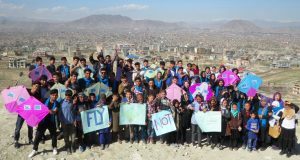 The children turned a cause for frightened hiding into a day of togetherness in the open, of solidarity, perhaps some healing, returning a message to the Afghan sky (and to its current U.S. masters) that they do not want to fear it any more. The following day, Ali and Qasim carefully loaded ninety saplings, plus shovels, pickaxes and buckets onto a bus already filled with eager young people who volunteered to plant trees at two different schools. The Volunteers have planted more than 600 saplings since they first started the Bamiyan Peace Park. Hakim and I talked about linking with communities in other war zones, being perhaps more deliberate about bringing a joint message from those living under the tyranny of war to the General Assembly in New York or another public forum. Early in my stay, Hakim had given a slideshow detailing antiwar resistance as far back as World War I—a century of war resisters. I’m now involved in a week of fasting and action at the U.N. to bring attention to starvation and war in Yemen. Since I went to Kabul, the conflict-driven crises in Somalia, South Sudan and North Nigeria have accelerated further toward famine, making up, along with Yemen’s nightmare, what is being called the world’s worst humanitarian crisis in seventy years. Trump’s slashing of U.S. contributions to U.N. relief agencies is the exact opposite of what the United States can and should do. As one of the wealthiest countries in the world, we should make famine prevention and feeding those at risk of starvation a top priority. We should also resist continued U.S. military buildup in Yemen and other parts of the world. To give humanitarian aid while continuing U.S. military strikes and U.S. support for the Saudi blockade of Yemeni ports is like giving money to the local fire department on one’s way to set an arson fire. Recall the horrible suffering and death in Iraq under economic sanctions. Efforts to alleviate the suffering were always too little and too late. The U.S. military menace there gave rise to ongoing chaos, displacement, and bitter civil wars. We cannot continue to look the other way as military and economic warfare destroys lives, communities and cultures. We must not lose ourselves in trivia and fantasy while the foundation of our real lives is the inescapable misery and suffering of others. We must seek for the ingenuity, skill and resources to solve critical problems facing communities here in the United States, perennially panicked into satisfying the bloated and obscene needs of the U.S. military industrial complex. I’ve had the extraordinary experience, in Kabul, of walking among and learning from desperate yet still hopeful young men, and young women. I have seen them working for peace, for their neighbors, and for a brighter future. That has to be a good start. Kathy Kelly (kathy@vcnv.org) co-coordinates Voices for Creative Nonviolence (www.vcnv.org). To Skype with the APVs on April 21st, their monthly “Global Days of Listening,” sign up at globaldaysoflistening.com.